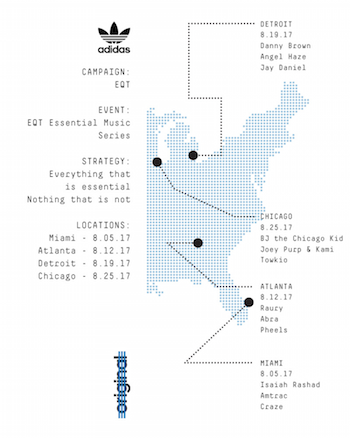 Following its Portland debut with DJ and producer Kaytranada, adidas Originals reveals four additional dates to its EQT 'Essentialism' free concert series in celebration of the origin of the EQT franchise. Concert headliners include multiple Grammy-nominated BJ The Chicago Kid, Raury, Danny Brown, Isaiah Rashad, and more to perform at select stops in Miami, Atlanta, Detroit, and Chicago. For the entire month of August, adidas Originals goes back to the basics, standing by the EQT philosophy – everything that is essential, nothing that is not. Dialing each performance back to its raw essence, this free and immersive concert series is reminiscent of 90s minimalism, Berlin circuit parties and underground culture. Inspired by the groundbreaking movements in music that came from each chosen city, the 'Essentialism' concerts capture and celebrate what makes each destination unique. Taking over a mix of traditional and unconventional venues for music – not unlike the warehouse parties of the 90s – the 'Essentialism' series applies the same pared-down approach of the EQT line to the carefully curated live performances. Sharing its storied history, each space will feature EQT displays offering an interactive overview of the line's heritage and its continued influence on streetwear. All featured hip-hop and electronic acts will perform stripped down sets personifying essentialism through music while strengthening and supporting the creative community at each select city. Follow @adidasOriginals and stay tuned for more information on how to join and RSVP to the concert series.